The transition to a self-service-based, modern BI model requires IT to adopt a collaborative approach that includes the business in all aspects of the overall program. This transition often involves choosing the right modern analytics platform. During this selection process, both the business and IT should assess each platform's ability to execute on the modern analytics workflow. IT enables this workflow, but it is primarily driven by business users and analysts throughout the organization. And its successful implementation requires collaboration and participation from all roles. 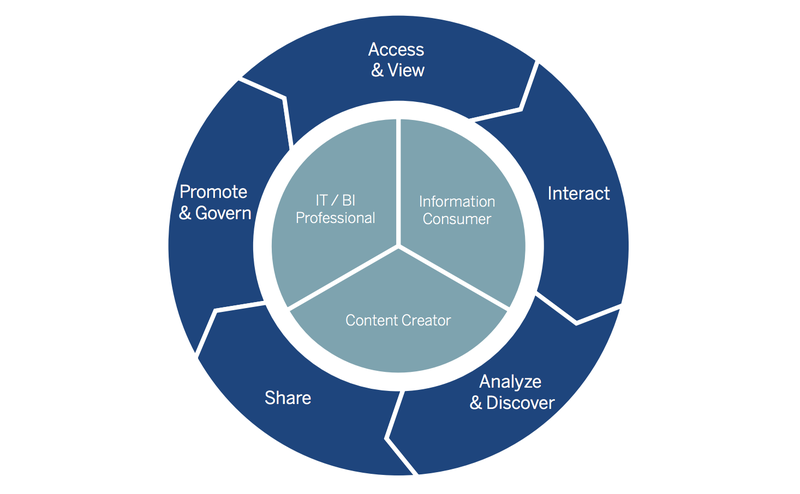 In order to select a modern BI platform that can be adopted and widely deployed, organizations should consider the platform’s value for each phase of this workflow from the perspectives of the IT/BI professional, the content creator, and the information consumer. As organizations begin the transition from a traditional top-down approach driven by IT to one based on self-service, it is often advantageous for IT (or a centralized BI team) to develop an initial set of trusted data sources and analytics content. Business users can then access and use this content as a starting point for their analysis. Over time, as users are encouraged to ask and answer their own questions as part of the modern analytics workflow, the domain of available trusted content will grow organically. Users will have access to a wider range of analytics content for self-service. Your platform of choice should enable IT/BI professionals responsible for the administration of the centralized environment where analytics content is stored and maintained, and data sources are administered and monitored. It should also address the needs of your information consumers who drives the specific usage requirements and parameters. The interact phase is an extension of the initial access-and-view phase of the analytics workflow. It offers information consumers need to perform guided analysis of available content within predetermined fixed boundaries as set by the content publisher. This phase spans a broad spectrum of user needs, and it is imperative that the platform seamlessly addresses these needs. This phase is of particular significance in the workflow as it differentiates data-visualization tools used to build charts from rich visual-analysis tools that use visualizations as the primary metaphor for analysis. As users interact with dashboards and generate new questions, users will inevitably encounter barriers and roadblocks as they reach the limits of the guided experience offered by existing dashboards. When this occurs, users require a self-driven, autonomous framework for asking and answering new questions that have emerged. Users of all skill levels must be able to visualize as they analyze and access the analytics capabilities of the platform while in the flow of analysis without having to move to a different module or product in the suite. The concepts of platform integration and ease of use are most critical to consider here, especially when considering the needs of the content creator and the information consumer. The transition from the “interact” phase to “analyze & discover” is often where the analytics workflow is disrupted due to lack of overall continuity of platform components needed to ask the next level of questions. The approach to sharing content has evolved. Within traditional BI platforms, sharing meant the delivery of static printed or exported reports to an inbox or a user’s desk. Within the modern analytics approach, sharing now includes collaboration and aspects of social interactions that we have grown accustomed to with all of our business tools. This transition is driven by the simple fact that information is outdated as soon as the report is printed or exported. And this doesn’t align with the needs of today’s consumer seeking the latest information. Some aspects of content sharing involve making information broadly available to users while others aspects entail collaboration as a core component of the analysis process. Consider both of these scenarios when evaluating your platform, especially from the perspectives of the IT/BI professional and the content creator. There are various approaches to governance. And every organization is going to fall at a different point on the spectrum ranging from an IT-led, highly-governed and control environment to one with little to no controls, with many organizations landing somewhere in between. Often times, even within one organization, the governance requirements may vary depending on the user needs within that area as well as the data itself. When choosing a modern analytics platform, flexibility is important to consider in order to meet those varying needs of the business and to ensure that you can alter your governance needs as you scale. An organization may choose to facilitate the transition from traditional to modern by initially using the modern platform in a traditional manner then gradually expanding the range of capabilities that are accessible to users through self-service. It is equally as important to evaluate a platform’s distinct capabilities in the separate but related areas of data governance and analytics governance. The tool should provide an adequate amount of flexibility to put the most appropriate governance model in place and adjust over time as needed. The shift from traditional BI platforms to modern analytics platforms is one that is necessary to truly realize the impact data can have on an organization. Modern analytics platforms bring together self-service and governance to empower the entire organization with trusted data to gain insights into the business. These platforms should be evaluated through a different lens as they break the mold of traditional, IT-run BI platforms. For a more detailed criteria, including a detailed questionnaire, check out our whitepaper, Evaluation Guide: How to choose the right modern BI & analytics platform. Modeling data governance standards is much efficient. Like the views expressed!